Design, Character Design, Architectural Design, Visual Development and Color Theory are presented. 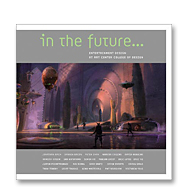 This stunning collection of sketches, renderings, and models created by the inaugural class of entertainment design students is a “must-have” for any fan of entertainment design and for those who have enjoyed the first Art Center student book, The Skillful Huntsman. Categories: Books, sorry you missed us // out of print.